Prepare the roast: The day before, we do a simple slow oven roast, rubbing the meat with olive oil and roasting (covered) for 1 to 2 hours at 200 degrees (depending on the size of the roast). Pull it out of the oven when it just gets to 120 degrees in the middle, because it will keep cooking a little. You want this meat very rare for the crostini. Prepare the crostini: Turn the oven on to broil. Slice the baguette into ¼-inch diagonal slices. Place the bread on a baking sheet and brush the tops of the slices with olive oil. Broil until lightly toasted (about 2 minutes). Remove, flip over, and brush other side. Broil until lightly toasted on that side. Remove and set aside. Once the crostini have cooled, spread a thin layer of mascarpone on each slice, saving some to dollop on the meat. Place one or two pieces of arugula on each slice of toast. 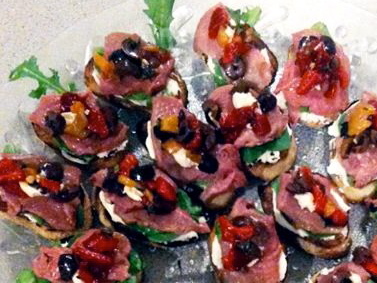 Fold the roast-venison slices to fit toasts, and place atop arugula. Top each with a bit of the cheese and about ½ teaspoon of the pepper/olive relish. Arrange the crostini on a platter and serve.